Over the course of the 2019 Spring semester, several political figures have visited Deming High School. InformationNation! has been honored to assist in hosting each and to facilitate student interaction with law makers. ​Xochitl Liana Torres Small is an American attorney and politician from the state of New Mexico, serving as the U.S.
InformationNation! received 70 entries for the Limericks of Love competition. An abundance of incredible expression documented teen love and relationships in limerick format. Following the slides show are the list of winners and their limerick prowess. To support high levels of rigorous educations, Student Database Professionals provided Prep-Time training for Deming High School faculty and staff on specific databases and how each may be utilized in a class-room setting. ​Click on the ELECTRONIC RESOURCES tab. Scroll down to REFERENCES & RESOURCES. Click on the desired database tab. Scroll further Down to E-BOOKS. Click on the desired e-book provider. The University of Arizona Derby Cats and The Crossroads City Derby teamed with InformationNation! to bring the students of DHS a HARD-HITTING and exciting literacy event. The exhibition, the last to be held in the old Wildcat main gym, began with motivational remarks about literacy from Ariana "Duchess" Saludares, a Deming native who has recently returned to town to care for her aging grandmother, Thelma Moore. Derby Cats and Crossroads showcased their skating warm-up exercises for the crowd followed by a thrilling, fast-paced abbreviated bout. Students had the opportunity to interact and visit with the athletes at the conclusion, capturing the moment with pics and selfies. A modified evening READ 'N Roll derby bout was held for the general public. Participants were treated to the same fast-paced, hard-hitting derby followed by relaxation and literature in the library. Students, Colton, Jordy, Laura and Karen offered research information on Roller Derby in the United States and in Mexico. Athletes shared their favorite books. Laura & Robbie Grant & the Crossroads City Derby Team; Sid & the University of Arizona Derby Cats Team; Tead White & Peggy Shepherd; Ariana "Duchess" Saludares, Brandon Saludares & kids; Thelma Moore; Dr. Arsenio Romero; Marlene Padron; Bernie Chavez; Sergeant Ramirez, Sergeant Ray & DHS JROTC; William Reynolds & Mantis Martial Arts; Jessica Leupold; Tony Valdespino; Gerard Flores; Samuel Villarreal; Mark Schultz & Pepper’s Super Market; DHS Filipino Teachers; Randi Morrow & Deming-Luna Chamber of Commerce; Jessica Etchverry & Deming Public Schools; Billy Armendariz & Deming Headlight; Grace Flores, Shanna Rudiger, Colton Villegas & Student Counsel, Jordy, Karen, & Laura; Artists Cheyenne Burris, Jennifer Chacon, Jacob Nevarez; David Jaramillo & Cats’ Network; Nelva Jones; Liz Kriegel & the Broadcaster Staff; David Monjaras. THANK YOU to all the students who respectfully enjoyed the motivational speaker. InformationNation! Transformation! DHS Library Media Services offers a robust collection of databases and e-resources. Student professional teams, under the direction of their teacher, Ms. Nelva Jones, selected databases, discovered their many features and amenities, prepared 6 - 11 minute micro-learning sessions and presented them to the faculty and staff of Deming High School. Following are the titles of the databases and e-resources that were highlighted: BrainFuse, Rosen Teen Health, Artstor, Quizlet, Vocabulary.com, World Book Online, Naxos Music and Spoken Word Library, Gale Cingage, Safari Montage and MackinVia. They and many more can be accessed from this website by navigating to the ELECTRONIC RESOURCES tab. Selected from over fifty limericks, below are the winners for 2018! It is always impressive to not only read the students' creative works, but also to listen to them read their limericks. Always super fun romance...!! LOL! When I look at you I see the sun. Let me be your moon, let me be your one. Can’t you see that you are my loved one? Because of the joy it can bring. My head grew heavy and hot. I searched for words and found naught. But, in my dumbfounded state, I could not. I stared at the hurt on his face. My steps, I wished I could retrace! And a kiss on his lips I did place! Her smile widened, ever bright. In the eyes of love’s delight. His eyes sparkle in the light. This feeling I cannot fight. My love he does not see. I think he loves her. I wish he loved me. As friends we have been near. Grown as friends over the years. I’ll be there if he needs me. In celebration of the opening of the new Deming High School Library, students prepared and showcased digital amenities, authors featured their work and signed copies, actors embellished Shakespeare, and Filipino cuisine provided savory sustenance. An incredible introduction of InformationNation! Transformation! The Children's Reading Foundation of Luna County provided literary gifts to attendees. Special thanks to the teachers and students who made the event such a wonderful success!! In preparation for the opening of the new Deming High School Library, InformationNation! Transformation!, over 16,000 volumes needed to be shelved. Over 20 volunteers, students, faculty, and community members, spent an entire night shelving and organizing books. What an AWESOME Nerd Force! A little over 14,000 volumes were accurately shelved and way too much fun was had along the way...!! LOL!! Thank you! Thank you! Thank you for the tremendous volunteerism that really was the driving force behind this smashingly successful Night of the Nerds!! A special thanks to Patricia at the Cookie Jar for baking the most scrumptious cinnamon rolls for breakfast! YUMMY!! Over the course of the 2016-2017 academic year, DHS Library Services and Our Humanity in the Balance (OHIB) teamed to bring about Skype exchanges between age-equivalent counterparts in conflict zones. While the goal and mission of OHIB reaches to and supports several other academic institutions across the nation, DHS Library services focused on exchanges specifically for DHS students: Tuesday, May 2nd (Iraq), Wednesday, May 3rd (Uganda) and student debriefing Friday, May 5th. Connections were made with key individuals and entities across the globe, World Peace and Reconciliation (WP&R), Genocide Watch, TeenSpirit in the Kurdistan region of Northern Iraq, and Panyadoli Secondary School's Peace Club in Uganda to support and nurture compassionate relationships and foster genocide prevention, human rights and peace activism. Students from TeenSpirit School (Iraq), Peace Club student representatives from Panyadoli Secondary School (Uganda) and DHS Wildcat students. OHIB's Terry Nickelson, Geysha Pathinathan and Debi Jacoby; WP&R's Adeeb Yousif, Tobi Indyke and Angela; President of Genocide WatchDr. Elisa von Joeden-Forgey, current president of Genocide Watch; and DHS's very own educators David Jaramillo, Kellye Stimpson, Grace Flores and Cynthia Williams. Oh!! What fun it is to team!! DHS Library Services, Memorial Elementary School, Nea-Deming, and the Children's Reading Foundation coordinated efforts in celebration of print and digital literacy. Dr. Seuss's Birthday brought out all sorts of fun characters: The Cat in the Hat, Thing 1, Thing 2, over 200 Memorial School Students, Horton, Gertrude McFuzz, nearly 30 Deming High School Students,The Lorax, Thidwick the Big-Hearted Moose, many, many community members. Even the Dr. himself attended the celebration! Twelve different literacy stations provided by talented high school students and educators led participants on both digital and print literacy adventures. The Children's Reading Foundation provided free book selection to participants completing at least five stations. 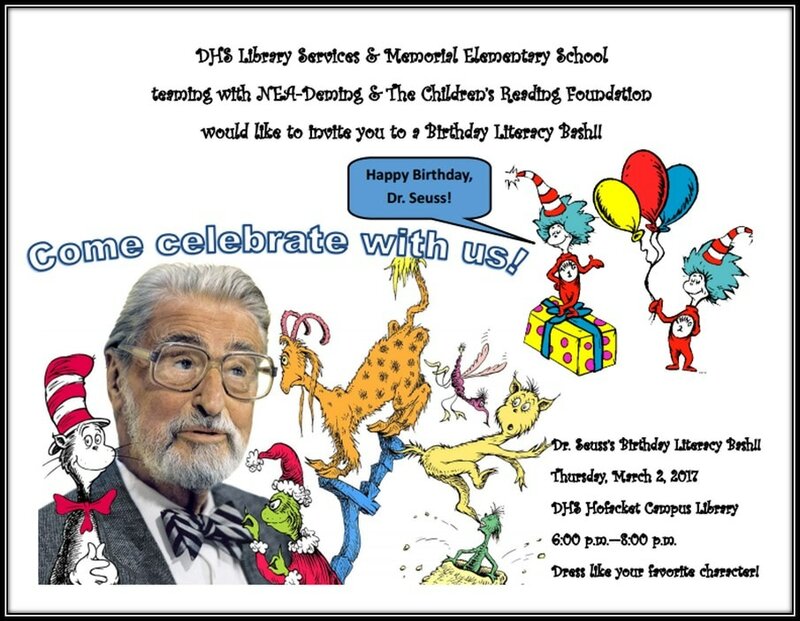 Memorial Elementary School supported with grant funding provided Dr. Seuss titles and a gift bag for each elementary student. Deming High School Culinary Arts Class designed and baked the Birthday cake delicacies. And, a bazillion other incredible, literacy-loving people lent their support before and after the event! OMGOODNESS!! LUSCIOUS LIMERICKS of LOVE ooze from these winners, and, so, boxes of chocolate are awarded. How being without you makes my heart crack. I wish you gave me the light of day. They were so small, yet a beautiful sight. when your kiss left me brighter than the night. After you kiss me and leave in a rush. A fleeting moment spent with my crush. But he couldn't stop my cries. Abandoned my heart to the lies. To showcase the many digital amenities provided by DHS Library Services, a DIGITAL LITERACY EVENT was held. High school students showcased to younger children and community members the many databases, e-book platforms, video and music streaming, and other such electronic resources available through DHS Library Services. The following two videos were part of an EDUCATORS RISING competition project which earned the team a FIRST place REGIONAL win. The students will compete at the NATIONAL level later in the spring. Partnering between Mr. Terry Nickelson, Our Humanity in the Balance, and Ms. Teresa Ortiz, Deming High School Library Services, brings an opportunity for students of Ms. Kellye Stimson's Advanced Placement Language Arts classes to Skype into an active genocide zone, the Nube Mountain region of Sudan. Today's youth live in a world in which millions have been and are currently being displaced due to war and genocide. By developing and refining the skills of witnessing, interacting, documenting, publishing, advocating, and archiving, DHS youth may become key players in establishing a new framework for responsible global citizenship, human rights activism, and genocide prevention. Much preparation, including technical, affective, and academic, is occurring to facilitate an early May 2016 Skype window. Student liaisons receive preparatory training. Translation is required for the Nuba Mountain Skype Exchange. Safie, a student having refugee experience and a passion to lend his expertise with language, works with the student liaisons. Much practice with phrasing, rate of speech, articulation, and volume are imperative to a successful exchange. who asked questions and discussed the contents of their student essays. ​at the home of OHIB executive director. Nearly 250 Memorial Elementary School children were the special guests for the Spring 2016 Book Fair & Kids' Read literacy event. teachers from the Philippines led outside games, and the Luna County Reading Foundation gave away books. ​Thanks to everyone who made this literacy event a huge success!! February brought a literacy event that pulled the heart strings with well-selected words and clever rhyme in Limerick format. With over fifty “Limericks of Love” submitted through DHS Library Services, the showing of creative verse from students and adults was impressive. Several large boxes of chocolates were awarded to the top limericks. Many different winter holidays are celebrated around the world. DHS Library Services celebrated traditional customs from the following countries: United States, Mexico, Philippines, Germany, France, and Norway. Holiday stories from the respective traditions and cultural foods were shared with nearly 200 attendees. Holiday music and caroling rounded out the event. A traditional Posada was celebrated. Santa and his elf gave away books provided by the Children’s Reading Foundation. A literacy and language carnival for the entire family highlighted the month of November. English, Spanish, French and Tagalog were spotlighted languages. Stories, poetry, activities, a play, and free reading materials were provided Children's Reading Foundation, Gila Reading Council, Poetry Out Loud, English Expo and other special guest readers. The Digital Projects Librarian from New Mexico State University presented The Digital Public Library of America.